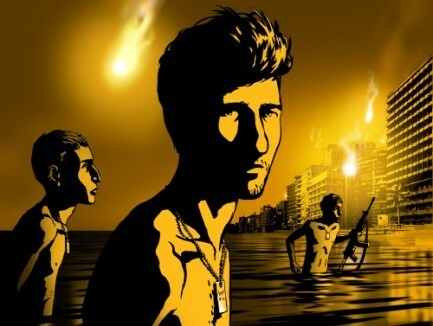 About a week ago, fearing that all of the films were turning my mass into flabby mush, I walked two brisk miles in twenty minutes to take in Ari Folman’s Waltz with Bashir, my fourth film of the day. The movie had been described to me by one critic, who purportedly writes for a newspaper, as “a little fiesta” — a qualification that I certainly quibbled with at the time. I’m not sure that a movie depicting the trauma of war and memory can be accurately identified as a “little fiesta.” Certainly, the real-life figures drawn from the Israeli Army do interpret a break between battles as a “little fiesta,” even if they do not precisely use these two specific words. It is true that these soldiers toil in homemade banana leaf huts on the beach and frolic about just before their comrades get shot in their head. But to suggest that these activities represent a “little fiesta” is, I suspect, missing the point just a mite. I’d like to think that the critic in question was having me on, but when I questioned him about specific points in Israel’s history, he had no knowledge of events that went down in 1967. A professional animator informed me that he had disliked the film because of its gimmick and what he characterized as “amateurish” animation, but this same gentleman had gone bananas over Shuga, a film that I did not care for very much. But it should be observed that the device of a journalist-like protagonist (here, Folman) who questions various people about the meaning of some hazy memory has its roots in Citizen Kane and numerous personal documentaries. I don’t think that Waltz with Bashir is a documentary exactly. It’s more of a recreated narrative with the appearance of an objective pursuit. Something akin to a memoir played out for the camera. Certainly the animation technique, of which more anon, lives up to this notion of reconstruction. If it is not technically successful, then it is certainly viscerally successful. The reality itself is the 1982 Lebanon War, and Folman was directly involved. He fought in the Isreali Army and, now in middle age, he retains a memory of naked young men emerging out of the water before a ruined city. Some key friends figure into this fugue: the long-haired Carmi Cna’an, the teenager who everybody figured would succeed in any science, now living in Amsterdam and fiercely protective of his privacy; Shmuel Frenkel, who has taken up vigorous physical exercise and maintains a bald pate; and Israeli war correspondent Ron Ben-Yeshai, who telephoned then-Minister of Defense Ariel Sharon about the massacres at Sabra and Shatila and was given a peremptory answer to back off. Each figure appears flat, representing a clear demarcation along a particular focal point. At times, it’s akin to watching a Flash animation or something involving cardboard cutouts from a pre-digital time. Folman’s team has added layers of smoke and reflections atop this basic approach. Folman also has respect for his subjects’ wishes. When Carmi Cna’an declares that Folman can draw him as he is talking about war, he requests that Folman not include his son. Sure enough, the camera drifts away from the house as Carmi Cna’an engages in this paternal pastime.